With the new ProjectWise SS4 Update we have some changes that need to be considered when planning on Full Text Indexing. First off is the fact that the Microsoft Index Server is not supported on Windows 2012 Server. This has been our indexing engine since full text searching was introduced in ProjectWise 2004. The update now supports both the older Microsoft Index Server on Windows Server 2008 and the new Microsoft Windows Search Server which if you are going to Windows Server 2012 is the only way to go. The new Windows Search Server does require a SQL server and for medium to large users this may need to be a separate SQL server to meet the expected load. Performance and scalability are much better with the Windows Search Server. Did you know that the ProjectWise Web Server provides integration with SharePoint 2010’s search tool. 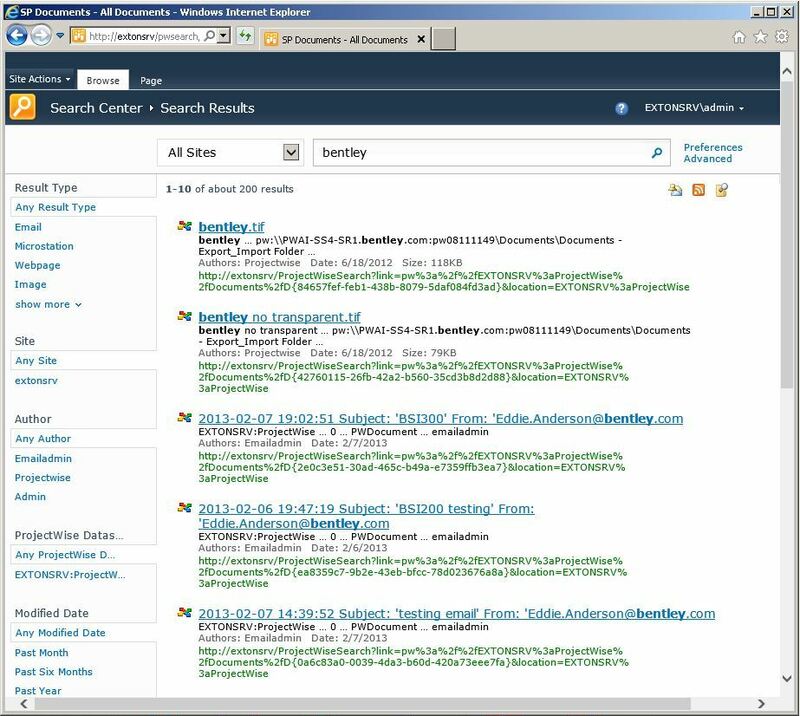 This allows users to search both ProjectWise and SharePoint at the same time from the same SharePoint search interface. The search results will show both SharePoint and ProjectWise documents side by side in the list. This is also the only way to search multiple ProjectWise datasources in one search. Notice the additional search filtering to the left side. Get the Most Out of Your Bentley Software Our annual user conference is now an even more powerful and intensive learning event for users of Bentley software. Formerly known as The Be Together Conference, it's been renamed to The Bentley LEARNing Conference, underscoring Bentley's commitment to make this the premier event for practitioner learning across the vast range of Bentley offerings.